The MAV1152 controller unit is used for the control of one proportional solenoids and additional switching valves. The proportional solenoid output is pulse-width-modulated (PWM) and optimally adapted for electric proportional control of Brevini Fluid Power products. The switched outputs are designed for the direct switching of on/off solenoids, relays, and lamps. The MAV unit can managed up to 5 analog input signal and 1 PWM current output + 5×2 switched outputs ( max load 9 Amperes ). 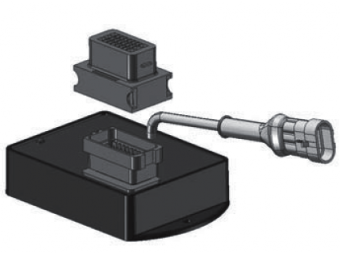 The RS232 serial interface and BPE software tool enables the connection of PC for service functions, such as diagnostics, parameter setting or display of process variables.